This is hardly a recipe. When you have something as preciously short-seasoned as blood oranges they demand respect. Respect to me is letting them glow, sharply-sweet, either on their own or atop something as simple as this roasted vanilla rhubarb. Or on my matcha yogurt breakfast bowl. I love the mystery of blood oranges. 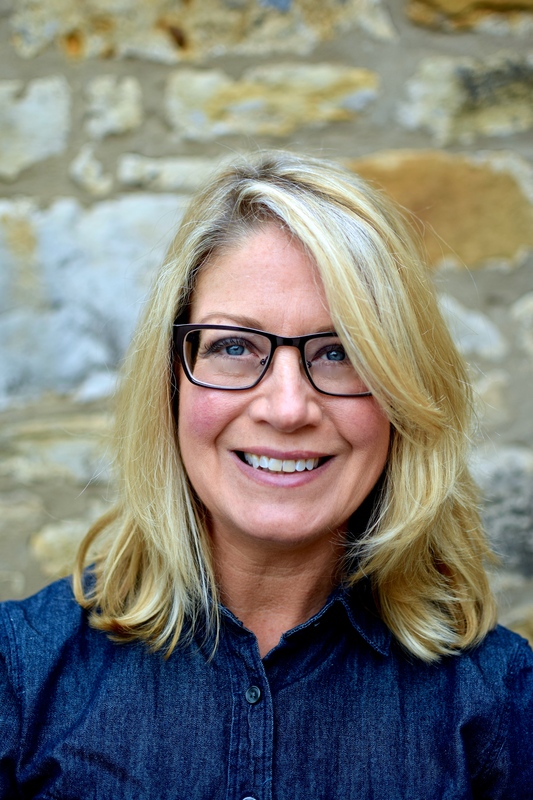 Food writer and friend of mine, Diana Henry, has noted that “the skin of a blood orange gives nothing away.” She is – as always – spot on. The only thing you know for sure is that you are in for an almost unbearably exquisite taste. Long before raspberries have turned from hard green buds into full-blown blowsy fruit, blood oranges tease us with their surprising berry tang. Throw in the clear but perfumed acidity of the most orangey orange you can imagine, and you will understand why the blood variety is so highly prized. Part of the lust for these fruits is their scarcity and short season, at least in Europe. I understand that California and Florida can be harvesting theirs well into May. On this side of the world these aromatic fruits are spent by March’s end. So, still a wee bit of time to indulge. Sicily is said to grow the finest specimens, but whether from California, Spain or Italy, I’ll fill my basket. When I start spotting them at the end of January I go a bit crazy and horde them like a mad woman. Ten at a time, or bust. Over the years I have lifted plastic nets of blood oranges from haphazardly piled pyramids (oh the indignity for this precious fruit! ), plucked up individual oranges cosseted in coloured and beautifully stamped tissue (respect! ), and had them by way of a white-jacketed chef in things such as ice creams, panacottas and homemade jelly sweets. Some of these raw fruits I was sure had been mislabeled. Is there really a hidden gem of ruby juice inside that, well, orange orange? Although I do like the reassurance of a crimson streak, if not the full dimpled scarlet cloak, I have learned to trust the label, even when all I see is a complete orb of orange. The beauty is definitely within. For this recipe, when blood oranges fall from season as imports from Sicily and Spain, substitute with fat navel oranges. Clean, seasonal eating. Track of the Week: Cloudbusting, Kate Bush (1985, from Hounds of Love) in honour of the news that Ms Bush is touring again for the first time since 1979. Excellent news. I will look out my kohl eyeliner. Simple. Clean tasting. Uber seasonal. Enjoy now. 1) Preheat the oven to 200C/400F. 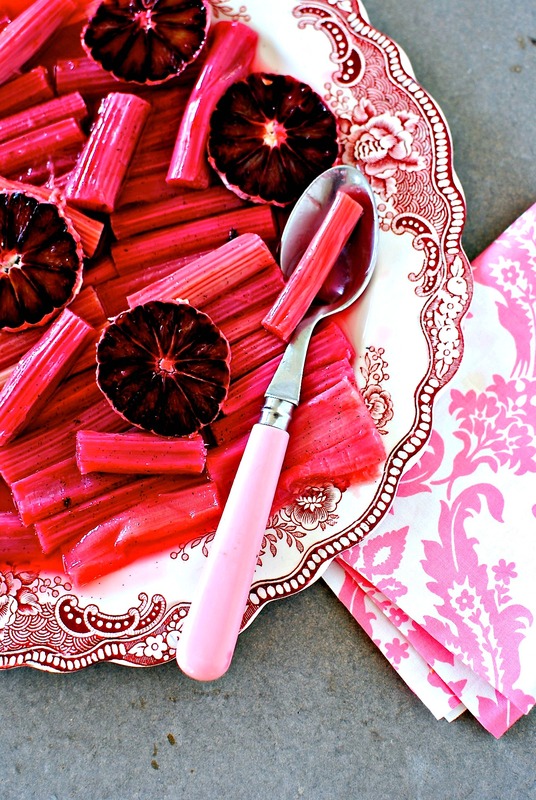 2) Place the still-damp rhubarb batons in a single layer on a long, rimmed baking sheet. You may need two. 3) Pour the sugar in a bowl. Split the vanilla pod and scrape the tiny black seeds into the sugar; rub the seeds and sugar together. 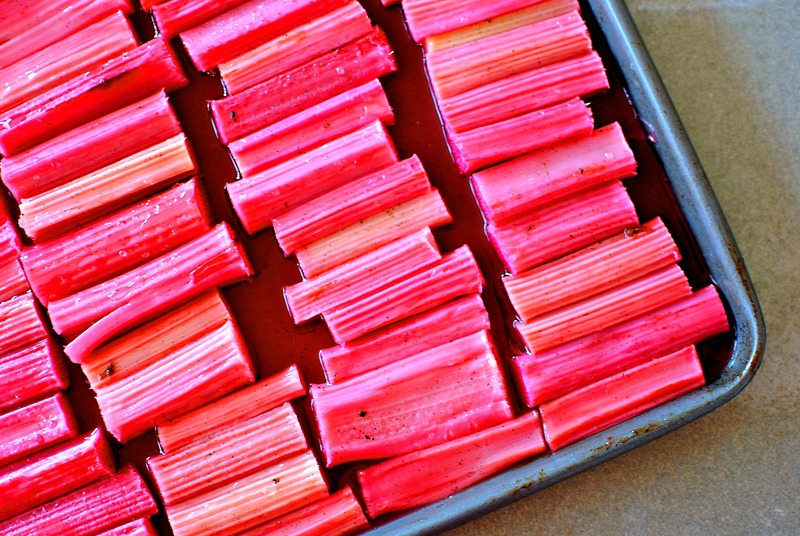 4) Sprinkle the sugar evenly over the rhubarb, cover with aluminum foil and bake at 200C/400F for 15 minutes, or until tender but not mushy. 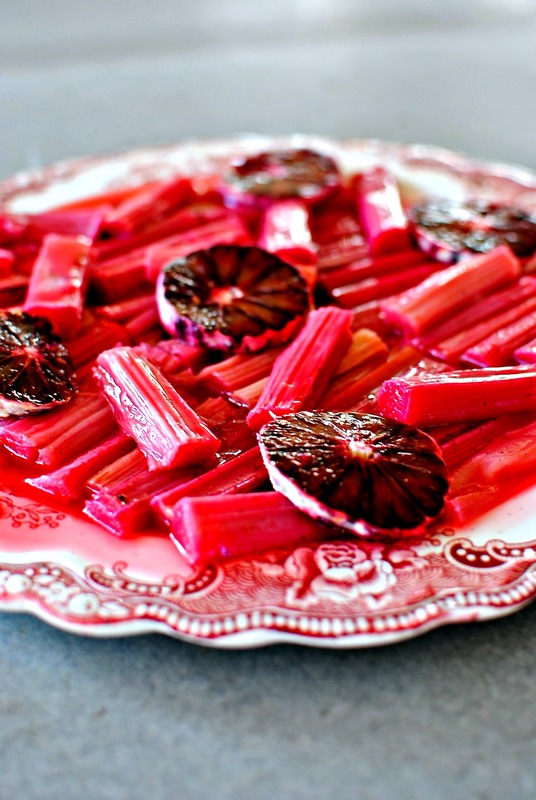 5) Allow to cool to room temperature then carefully lift the roasted rhubarb onto a serving plate, tip the syrup all over and top with slices of orange. Eat and enjoy. This is also fantastic with yogurt and with non-fruited granola. yes, thats right, the tall gentle man in cost cutter. He’s been there ever since I can remember and never looks any older – must be all that nice fruit and veg! Yum this looks very good. I just made carmelized blood orange sauce over seared scallops. I am enjoying blood oranges this year, I don’t normally delve into using them as an ingredient. I think that rhubarb will be in short supply due to lack of frost. Wonderful,rich colours_GiGi’s plate looks good too. I am on the trail of blood oranges already! You have made me realize I’ve not enjoyed enough blood oranges this season! On the shopping list. 🙂 Love the rhubarb-blood -orange pairing. Blood oranges are so beautiful! There was an abundance in California, and I remember trying them oven dried to a crisp and used as a vehicle to carry a beautiful fish ceviche. Oh memories! I love what you’ve done here! Funnily enough I have made a ceviche in the past with blood orange and grapefruit. Dried – now that’s fancy! Sounds like my plant! It is OLD but I can’t seem o dig it up and get rid of it. We inherited it with the house some 18 years ago. It is even too tough to split and make new plants! You must have read my mind. Guess what I have made this week. Vanila poached rhubarb but I did it in a shallow wide pan. I hate it when it breaks up, which is definitely the advantage of baking it on a long tray. I also bought 2 bags od blood oranges from Natoora via Waitrose. Me & the kids have been enjoying them and they are staggered by the difference in colours from 1 fruit to the next. I also made blood orange curd but the flavour and colour is slightly lost I think. I think rhubarb & blood orange is now one of my favourite flavour combinations! I need to tell her I’ve quoted her (from her Telegraph column). Yes, the colure of both are so pretty and vibrant. I didn’t have much to do with that though! 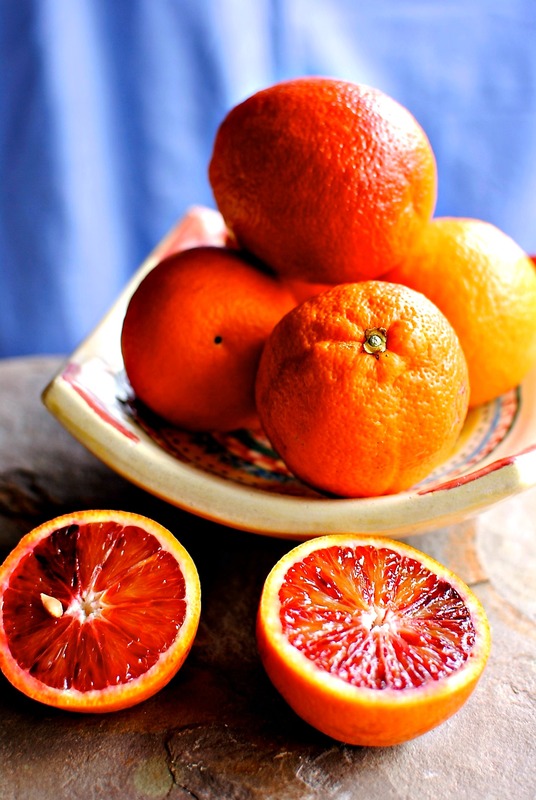 This is such a beautiful post – truly an ode to blood oranges. I love the photography too – and suddenly my grapefruit isn’t quite as tempting! I love a good grapefruit! And thank you, Laura. The colours were so pretty that the pictures kind of took themselves! An exquisite combination, Kellie. And a gorgeous post! Such a simple delicious dish! Dare I say I would like to try this with a bit of vanilla bean ice cream??? Only you, with your poetic prose, could get me to re-visit blood oranges 🙂 it’s not that I don’t like them, but I do so love Cara Caras, that they have displace blood oranges for me. Definitely time to re-visit that! And, rhubarb! Can you believe we used to grow this in my parents garden, but now I have such a hard time finding this is the stores? Time to change this too! I’ve not had California bloods but I can get Sicilian ones which are probably one of my favourite foods, never mind fruits. We don’t get your Cara Caras but I remember you writing about them and they sound superb. Rhubarb is a hugely tolerant plant. We have a crown that pops up every year but it is an old old plant that doesn’t really taste that great (but I can’t bear to get rid of it!) so we buy ours from a really lovely greengrocer near us. But we can get rhubarb anywhere as it is a good crop for the UK. Love this combo. You inspired my weekend baking. Hazelnut, orange and rhubarb cAke. Need to tweak as I couldn’t taste the orange. Was very good though. Although not a fan of hazelnuts the general idea appeals. I have made a blood orange cake but found the colour was very insipid and the flavour terribly muted. I wonder, for myself, if I should have concentrated the juice. Anyhow, I’m sure as a proper baker yours is still fantastic, but that you have very high standards. ;-). Lovely photography, such vibrant colours. WordPress recommended your blog and I’m so glad they did. 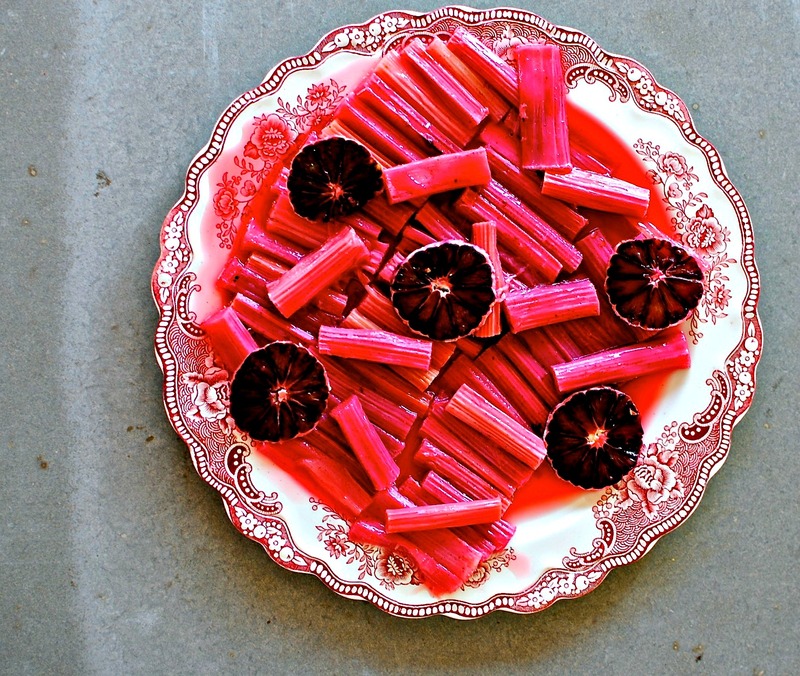 This sounds like a beautiful recipe – I’m looking forward to when rhubarb comes into season here. Do you think the recipe would work using honey as a sweetener instead of sugar? Thanks.